The human immune system is fluid, dynamic, always changing. The quest to understand it resembles the classic mathematical problem of circles within ever larger circles—each question begs another, then another, and on into infinity. True immune tolerance occurs when one's immune system accepts foreign tissue without mounting an immune response against it.The inability to achieve true immune tolerance has dogged transplant medicine since the first organ transplants were attempted in the 1950's. Ever since, immunologists have followed one promising train of thought after another, running into numerous dead-ends along the way. Emory transplant surgeon Kenneth Newell likens the immune response in transplant patients to an iceberg. A tiny tip pokes innocently above the waves, while the bulk of it lies hidden below the surface. "Under the ice, and deep inside, there's a lot happening on many overlapping levels that we can't see," Newell says. "We often don't realize what's happening until a patient suffers an overwhelming rejection or a bad infection or cancer." Emory scientists are seeking to uncover what's below the surface to change the course of nature. Lifetime immune suppression is an enormous burden for those who've had a transplant. Patients take about 30 expensive pills a day, leaving them vulnerable to fungal, viral, and bacterial infections. The drug regimens include the long-term use of steroids, which can lower protective immunity and increase the risk of kidney and cardiovascular disease. Unusually aggressive lymphomas and skin cancers are also risks. The most commonly transplanted organs, kidneys, are targets for the toxicities of cyclosporine, a calcineurin inhibitor that is a standard immunosuppressant drug. Eight to 10 years after the original transplant, replacement of transplanted kidneys is far too common. In fact, immunosuppressant drugs themselves can hasten the need for a replaement transplant. They can cause hypertension or renal disease, leading to organ failure in 20% of patients. Newell leads the Emory arm of the NIH Immune Tolerance Network, an alliance of transplant research centers working to uncover the basic biologic features of clinical tolerance. "We try to tweak the amount of immunosuppression, so patients receive just enough but not too much," says Newell. "Our techniques remain rather crude. We start everyone on the same regimen. If someone gets more infections or cancers, we give them less. If they have rejection, we give them more." 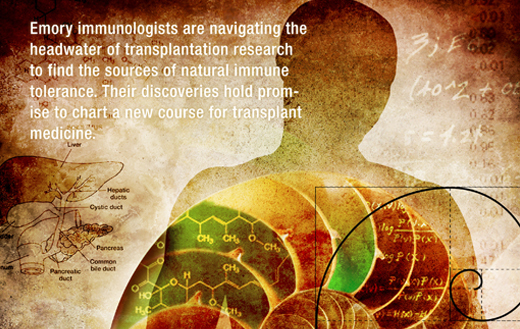 Ideally, physicians will learn to predict how each patient's immune system will respond to a transplant. Then, medications could be titrated individually without the need to wait for rejection or infections to indicate whether the dosage is too strong or too weak. Unique immune signatures to measure how much immunosuppression each patient needs to control rejection is a prime example of personalized, "predictive" medicine, says Newell, who is working with scientists at the Emory Transplant Center to pin down immune signatures. These may involve gene expression, proteins, enzymes, or some combination thereof. Identifying indicators of an immune signature would go a long way toward efforts to induce complete immune tolerance for transplanted organs—the ultimate goal of the transplant clinicians at Emory. 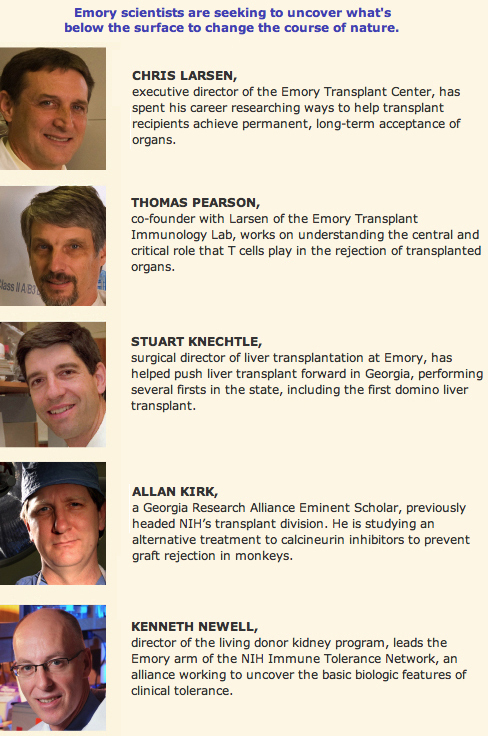 Allan Kirk, a Georgia Research Alliance eminent scholar in transplantation immunology, leads a multicenter study involving long-term transplant patients who have done well on low doses of immunosuppressants. These patients are put on a carefully supervised dose-reduction program and monitored closely. Newell, who directs Emory's living donor kidney program and works with Kirk on the study, hopes to learn what is special about patients who don't need as much immunosuppression as usual. "We'd like to know what's different, whether it's gene expression or a certain type of cell," he says. "It would be nice to find a ‘signature' to predict who needs more and who needs less. Then we could just start everyone on the correct dose. But until we have the science to back it, that exposes a lot of people to the risk of rejection." In the meantime, important clues lie in studying patients who neglect to follow their doctors' orders. "There are some people out there who simply stopped taking immunosuppressant therapy and remained perfectly well," says Newell. "Some stopped because of infections or tumors. Some are rebellious. Many can't afford the drugs. One person I talked to hasn't taken any immunosuppression since the mid-1970s." Reducing unnecessarily high doses of immunosuppressant drugs in children who have kidney transplants is the aim of another study Kirk leads. Clinical Trials in Organ Transplantation in Children is a five-year, $6 million NIH study by Emory's medical school, Children's Healthcare of Atlanta, and children's hospitals at UCLA and Stanford. It seeks to find new ways to make drug therapy safer for children who have undergone kidney transplants. Traditionally, immunosuppression doses for children are known to be higher than necessary. "Children are usually over-immunosuppressed," says Kirk. "Their growth patterns come in fits and starts. To cover every possibility, we now give every child the same dosage, based on their weight when they come into the clinic. Even so, the immune system doesn't necessarily grow in correlation with a child's weight gain." A new type of anti-rejection drug may work better to blunt the natural immune response, preventing organ rejection but maintaining kidney function following renal transplantation. Emory transplant surgeons Chris Larsen and Tom Pearson were pioneers in developing and testing the new compound, known commercially as belatacept. Larsen, director of the Emory Transplant Center, says belatacept holds the promise to transform transplant medicine. In 1991, he and Pearson, the Livingston Professor of Surgery, began studying a fusion protein, made from a fusion gene, which is created by joining parts of two different genes. Combined with other agents, this protein showed promise in mice as a reliable immunosuppressant after renal transplant. The resulting compound, now known as belatacept, is a costimulation blocker. Costimulation refers to one of many signals that T cells need from other cells to become fully activated. Belatacept binds to a specific site on certain cells of the immune system to block a signal necessary to activate T cells. Decreasing the activation of T cells decreases the number of T cells that can destroy grafted organs. "Developing a mouse model wasn't that difficult, as is usually the case," says Pearson. The compound worked well in mice but not in nonhuman primates. Based on the findings in the Emory lab, collaborators at Bristol-Myers Squibb tweaked the compound to work better in nonhuman primates. On further testing at the Yerkes National Primate Research Center at Emory, Larsen and Pearson found that the new version of the compound showed enough promise in nonhuman primates to take the testing to clinical trials in people. In the three-year phase III trial that wrapped up in August, patients were randomized into three groups of recipients, including those who received a more intensive regimen of belatacept, those who received less intensive dosing, and those who received cyclosporine. The result? Patients receiving belatacept had the same patient/graft survival rates as those receiving cyclosporine. The patients on belatacept, however, had much better kidney function and better cardiovascular and metabolic profiles than those on cyclosporine. Also, belatacept was better tolerated and safer than cyclosporine. However, in this trial, cyclosporine still provided a lower rate and grade of acute rejection. Research is continuing, with belatacept set for imminent approval by the FDA. Belatacept will enable the lives of many transplant patients to improve dramatically, says Larsen. "It's amazingly rewarding to see something all the way through like this—from the research bench to the patient bedside," he says. Other work is coming from the lab pipeline to patients. Allan Kirk and colleagues at the NIH and Yerkes are studying a less toxic combination treatment for immunosuppression that has shown promise in monkeys. The regimen opens the door for transplant patients to take medication once a week rather than a dizzying mound of pills every day, says Kirk. Specifically, the treatment uses a costimulation blocker to interfere with the T cells that cause organ rejection without affecting other organs. In addition to the costimulation blocker, the treatment uses a protein called alefacept to subdue memory T cells. By themselves, neither costimulation blockers nor alefacept could prevent rejection in monkeys. But the combination of the two, in addition to the transplant drug sirolimus, continued to work for months after the treatment ended in monkeys, as reported in Nature Medicine (July 2009). Because alefacept and sirolimus already are used in humans, the researchers believe a clinical trial could be developed quickly to bring lab findings to patients. When it comes to transplants, some organs succeed better than others. A living donor organ usually fares better than one donated from a nonliving donor. "Younger is better than older," says Newell. "Living is better than dead." Living donor kidney transplant programs make a big difference. One-third of kidney transplants at Emory and across the country now involve living donors. "We've seen a five-fold growth in living donors in the past 15 years and not only among parents or siblings," Newell says. "It's people from church or school or friends. A middling match does just as well as a genetic match. "Living donor kidneys last twice as long as organs from someone who is brain dead. We used to think genetic matching determined success because living donors are so often relatives. But living donor kidneys are actually better because the organ has spent less time outside the body." Time stored is the crux of the problem with organs from nonliving donors. Brain death exacts harm as well. The more time that elapses after brain death, the shorter the organ's life span after transplant. The living donor team performed Emory's first "paired" kidney transplant in October. In a paired transplant, two donors and two recipients swap kidneys. The new procedure helps those who need a kidney transplant and have a family member or friend who is willing to donate a kidney but whose organ is incompatible with their own because of blood or tissue type differences. With the paired transplant, four people come together. The first pair of donor-recipients has a healthy kidney that is incompatible for their pair but that is compatible for the second pair of donor-recipients. So the first incompatible pair donates a kidney that is compatible to the second pair, and the second pair donates the kidney that is incompatible with their pair back to the first. The swap allows for two living donor transplants. Among transplanted organs, the liver has the fewest problems with immune rejection, according to Emory liver transplant surgeon Stuart Knechtle. "This fact means that we have more possibilities to explore," he says. "It also means that there is much to learn from the immunology of the liver that might be useful elsewhere in the body." The second most commonly transplanted organ, the liver is highly vascular, and its transplantation requires a complicated, lengthy, and highly technical procedure. Expert surgeons are necessary for a liver transplant program, and in the past two years, Emory has recruited some of the top liver transplant surgeons in the nation. During the past year, Emory's transplant team has pushed the advances in liver transplant forward, performing several rare procedures and important "firsts" in Georgia. These procedures include a specialized transplant to replace the bile duct that runs between the liver and the gallbladder, a simultaneous heart-liver transplant, and liver transplants for HIV-positive patients. In July 2009 in a 10-hour procedure, Emory liver transplant surgeons performed Georgia's first domino liver transplant, so named for the sequential nature of the surgeries. A liver from a deceased donor was transplanted into Jean Handler, 24, who had suffered since birth from maple syrup urine disease (MSUD), a genetic disease that keeps the body from breaking down certain amino acids. Handler's own liver was transplanted into Robert Massie, a 53-year-old Harvard professor, who was born with hemophilia and had contracted hepatitis C and HIV in the early 80s from donated blood products. The first transplant in effect cured Handler's MSUD. Because MSUD does not exclusively affect the liver, its cause deriving from lack of a particular enzyme in all cells of the body, Handler's own liver could be given to Massie because his non-liver cells make the missing enzyme. Fewer than 100 of the procedures have been performed in the United States. Knechtle explains why: "Domino transplants are still quite rare in part because there are few situations that lend themselves to it." While rare, domino liver transplants offer one more way to cope with the national shortage of organs available for transplant. The Emory Transplant Center's comprehensive program is one of the busiest in the country, offering transplants in heart, lung, liver, kidney, pancreas, and pancreatic islet cells. In 2009, Emory surgeons performed a total of 230 transplants for adults and children. Emory brings together doctors, nurses, social workers, financial advisers, administrators, and a chaplain to foster a family-centered approach. Patients and families dealing with any stage of transplant may stay at the Mason Guest House, a private retreat that offers affordable lodging and is supported by the Carlos and Marguerite Mason Trust. The Emory Transplant Immunology Lab, founded in 1991, is one of the nation's leading laboratories working to achieve true immune tolerance after transplant and to free patients from the need for continuous drug therapy. Current programs are exploring less toxic medications for kidney, pancreas, liver, lung, bone marrow, composite tissue, and xenotransplantation (the transplantation of living cells, tissues, or organs from one species to another, such as from pigs to humans). For more information, visit emoryhealthcare.org/transplant-center/, or call 404-712-4621.